Real Oenophile 1: I get a sizzling-crazy volatile nose. What do you get? Real Oenophile 2: I get French oak, Colombian coffee, Swiss chocolate, high-octane gasoline and cat pee. Both: What do you get, Jules? Either they were making it up, or I should trade in my nose and mouth. But eventually, one of the winers — winees? oenophiles? sip-‘n-spitters? one of the experts in the subtler qualities of fermented grape juice — took pity. She endeavored to lead me from blissless ignorance into the secret world of wine. My sensei, wine-writer Laura Ness, went over the drill slowly, patiently, sip-by-tiny-sip. I never quite spat, but in time, under the Laura’s tutelage, I sniffed longer, swirled more and started to pick up at least hints of the extra flavors my fellow travelers kept discovering: pine tree, resin, grapefruit, maybe even bubble gum. I never did taste melon. Or butterscotch. Or cat pee. And I came to accept that failure as a consequence of my limitations… limitations I can live with. Kind of like not spitting. 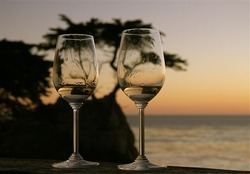 Even without the alcoholic enhancement of the wine, Monterey is stunningly beautiful country. From the inland hills to the lone cypress guarding the rocky shores of 17-Mile Drive; from the post-industrial quaint of Cannery Row to the agricultural heartland of River Road, this is California at its most Californian. It’s got blue Pacific, piebald coast, green fields of artichoke, gray-misty mountains and the pale ghosts of John Steinbeck’s Chinese store owners, Oklahoma farmers, drifters, grafters and whores with hearts of gold. All that, plus a rather nice Chardonnay to accompany a dinner of fresh, sustainable fish.